If these chocolate Tinder brownies had a tagline, it would be: Here today, gone tomorrow. 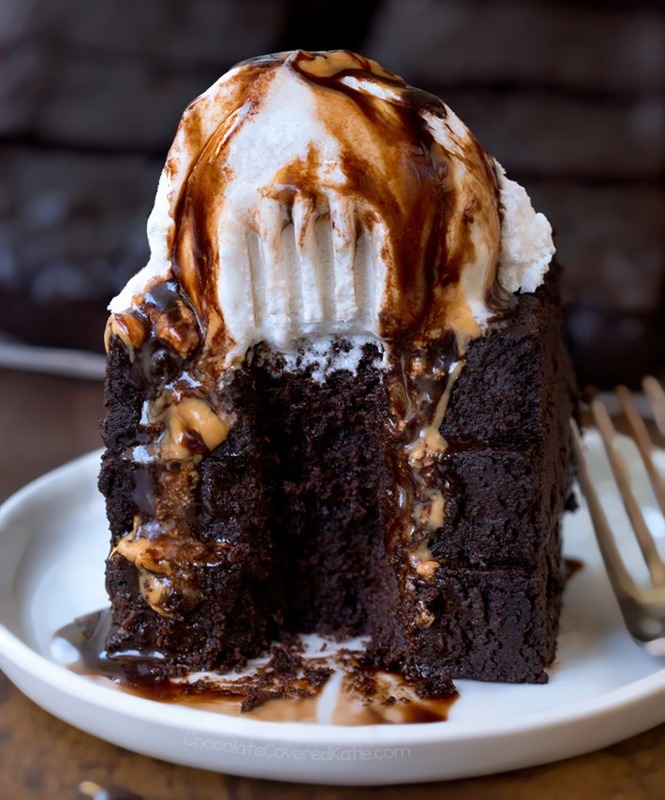 They are everything you could ever want in a brownie. 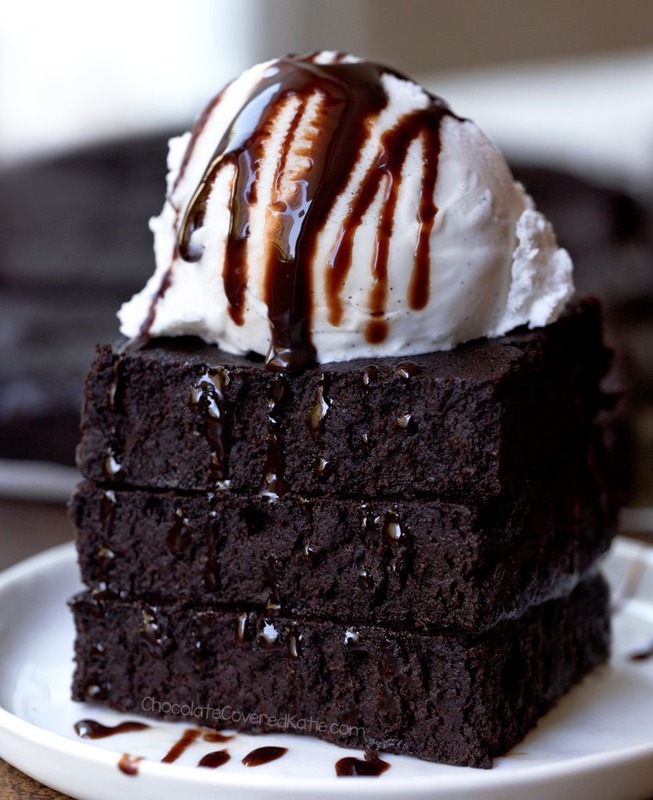 You will wonder how a brownie could possibly be so perfect. You will wonder if it’s all a dream. 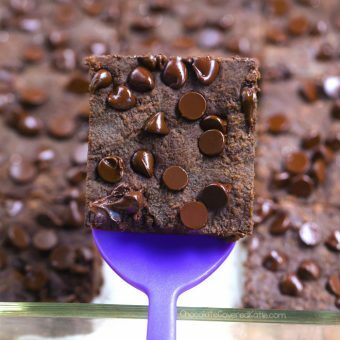 You’ll want to swipe left on all other brownie recipes. 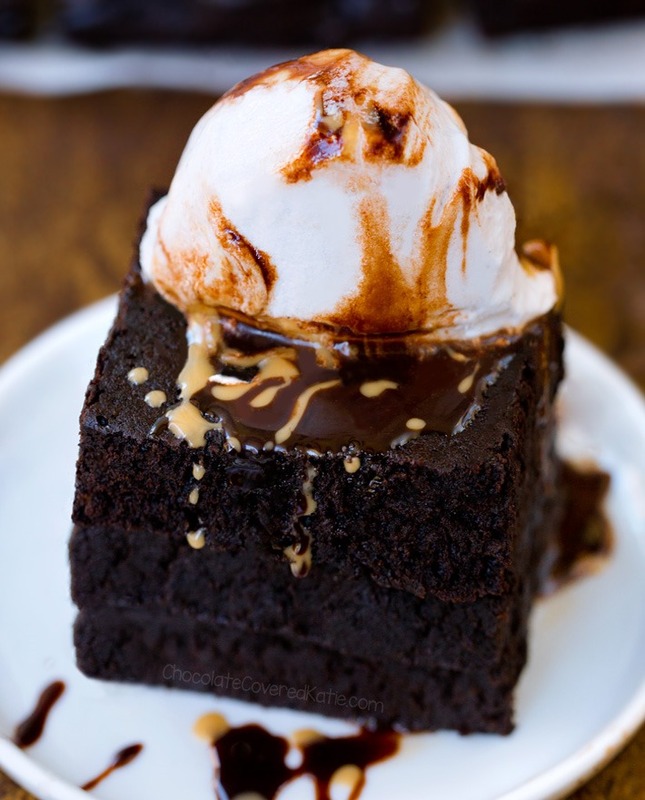 You can’t imagine even thinking of any other brownie, ever again. Then, suddenly the brownies completely disappear. You are left staring at an empty plate and wondering what could have possibly happened. You ask all of your friends, but they don’t know the answer. Thankfully, you need not be upset for long. Just head right back into the kitchen to swipe right on another batch of brownies. The brownies were adapted from my favorite vegan brownie recipe and turned out even thicker and fudgier than the originals! I also made them with water instead of milk of choice this time, to more closely mimic both the taste and texture of traditional brownies. If desired, you can top them with Coconut Ice Cream, or Keto Ice Cream, or even Almond Milk Ice Cream. While I can think of quite a few puns for this post, unfortunately none of them are appropriate for my blog. In the interest of keeping things PG, I will simply say that you can add either nuts or frosting if you wish, but the brownies are still delicious without. Every now and then, someone actually finds true love on Tinder. This is one of those times! Preheat your oven to 330 F. Line a 9×13 pan with parchment. Combine dry ingredients in a large bowl and stir very (very) well. Whisk in wet, and smooth into the pan. Bake on the center rack, 22 minutes. They should look underdone when you take them out. 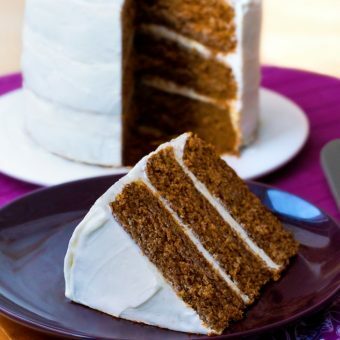 Let cool, then refrigerate at least 8 hours (preferably overnight), during which time they firm up considerably without becoming dry and will also taste much sweeter with a deeper flavor. 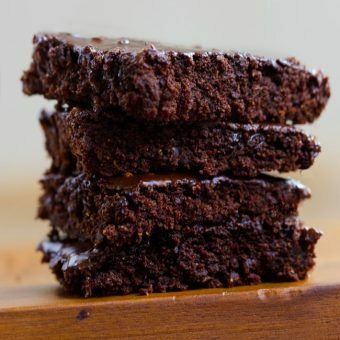 I think these brownies have the best flavor and texture two days after they’re made… if you can keep them around that long! Well, you’ll always have the Ryan Reynolds Blondie Bars. 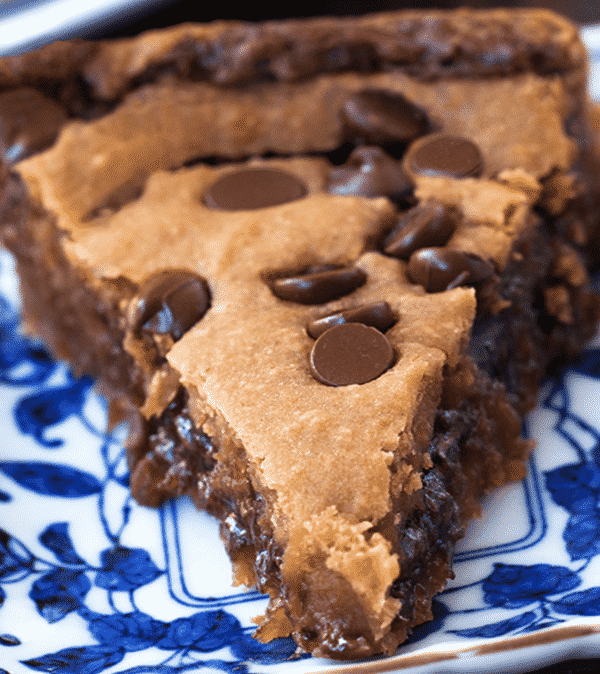 And this Makeout Chocolate Chip Cookie Pie. Considering no one is searching for tinder brownies (because such a thing didn’t even exist until just now), I know the post isn’t going to get me any big SEO benefits. But honestly, I do not care in the slightest, because I had way too much fun writing it! The restaurant I used to work with used salsa as a base over the crust on its breakfast Cake. Yummy. Sorry we haven’t tried, but be sure to report back if you experiment! Those look awesome! The Tinder thing amused me too, real love on Tinder does exist! Look delicious! Will gluten-free flour work for these or not? I see you suggest the blonde brownies for gluten free but there are ingredients in those I cannot eat. Thanks! Unfortunately we only know how the results will be with flours listed because that’s all we’ve tested, but feel free to try out a gf mix such as Bob’s all purpose, or oat flour, and be sure to report back with results if you do experiment! Those do look amazing! One question, what is the difference between the two types of cocoa powder you list? I’m going to take the liberty to respond.. Dutch processed cocoa has a bolder/deeper chocolate flavor and often referred to as ‘dark’ cocoa. It’s still the same thing as regular cocoa powder the difference is in how it is processed. Dutched cocoa is alkalized to help remove bitterness and also remove some of the fat content. It can be very fragrant and unique compared to regular cocoa. Is there a place on your site to give general comments? I was just wondering if you’ve had any yogurt making luck. I’d like to try making DF yogurt as store-bought yogurt gets spendy and has funny chemically taste. I can look around the web, of course, but I have had success with your site so thought I’d check first! Hi! We haven’t tried it yet but it sounds like a fun experiment! Love your recipes, and this one won’t disappoint, I can already tell! Any chance you could add grams measurements, for those of us who use them? Hi Aurelie! Just look on the labels of the ingredients and they should all list gram measurements. For example, 1 cup of most flours is equal to around 120-130g, and it should say on the label’s nutrition panel. Hope that helps! 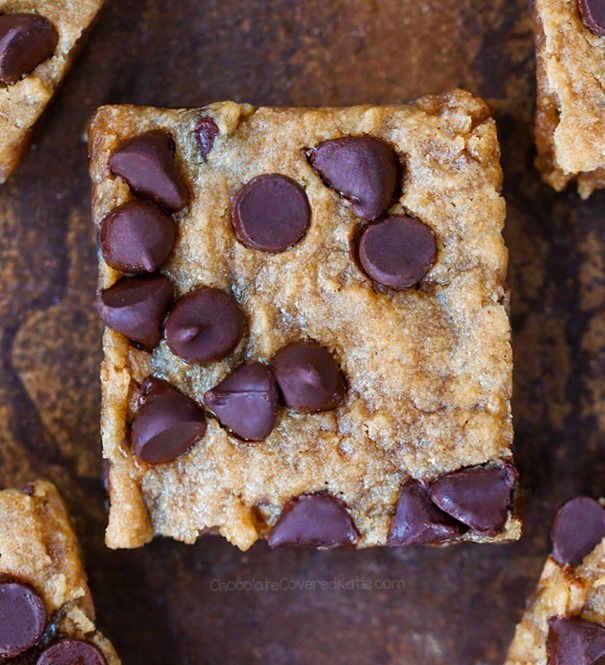 From Ryan Reynolds Blondies to Workout Brownies, you never fail to come up with the most creative names for your recipes! 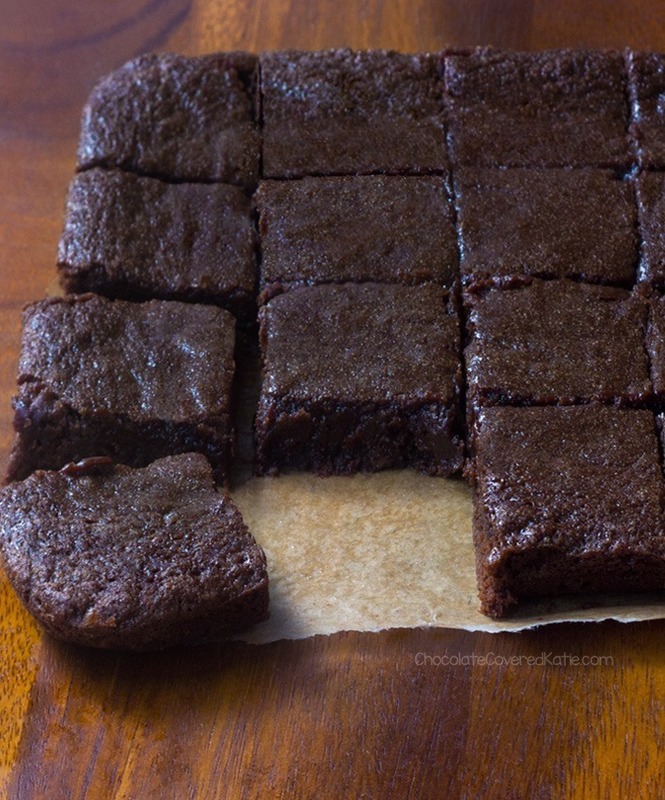 Absolutely LOVE this adaptation from your standard brownies. They look so plump and moist! The ice cream scoop…my GOD, that is a serious A-game move! That’s an incredibly rude thing to say. You could just not comment if you don’t like something. Looks great, I just wish it were more of an honest representation. Nutritional info is for 24 brownies, pic of tray shows 12, and the recipe calls for 1 tray… so they’re actually half that size if you don’t want to double the cals. I enjoy your creative recipes, though I may not always make them they’re fun to read. I have to say though, the pic of the cut brownies in the pan is a little unattractive. May I suggest, you heat your water and oil to between 110-120 degrees Fahrenheit and mix your sugars into that, which will melt the sugar a little more in the beginning, tho you don’t want it 100 percent dissolved before adding it to the rest. This should yield a lovely shiney brownie top that looks like it came from a high end bakery with very little extra effort. I have not done this with cocoa powder brownies however, only actual chocolate. Hopefully it will still turn out as pretty. P.s. also toasting the nuts for a few minutes first can add a lot of oomph. Then toss them in a little reserved flour with the chocolate chips to keep them evenly distributed in the batter without sinking. These are the tips I wish someone had told me when I first started baking. So am i reading this correctly that it’s 2 different sugars BOTH 3/4 cup brown sugar /coconut sugar AND 2/3 cup unrefined/ regular sugar or do you pick either brown sugar OR regular sugar? Both – the two will add different things to the recipe.